Sectionals are behind them. New Directions have another goal in mind when Glee returns on 4/13/10. Finn rehearses a song in this scene from "Hell-O." It's the spring premiere of Glee. Will assigns the group a new song in this scene from Glee. It's from the spring premiere episode. The women of New Directions take the stage in this photo. It's courtesy of the episode "Hell-O." This is a photo from the spring premiere of Glee. It airs on April 13, 2010. 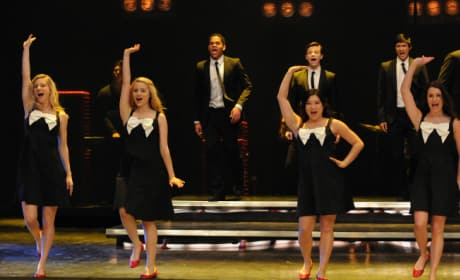 Rachel gets her singing on in this scene, as New Directions rehearses a song on the return episode "Hello." 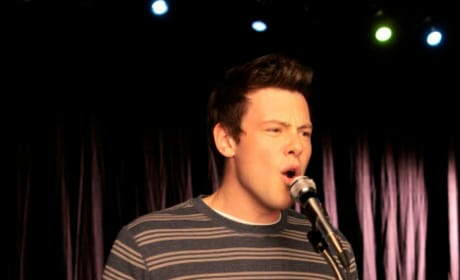 Rachel is her typical singing self in this scene from Glee, while Finn has never looked more unhappy. 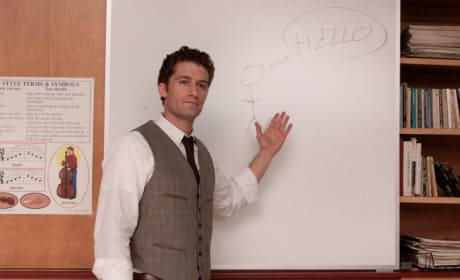 Will meets Shelby in this scene. Played by Idina Menzel, she's the coach of Vocal Adrenaline. Idina Menzel guest-stars as Shelby Corcoran on Glee. She's the leader of Vocal Adrenaline. I did set the season record for being sacked... but we only won one game. Emma: I didn't know you could cook. Will: There are so many things you don't know about me. I can't wait to introduce them to you.